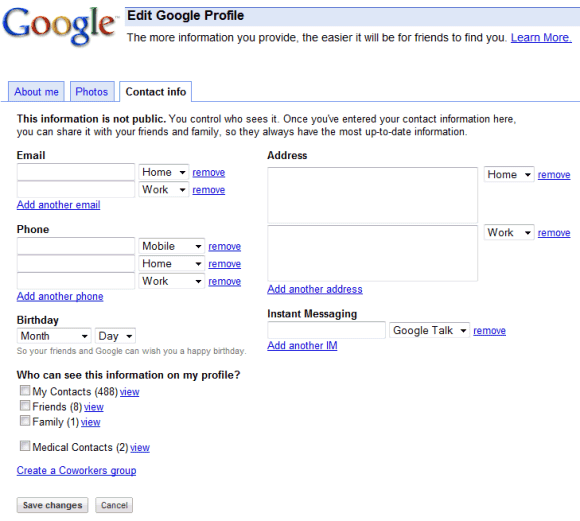 Google Profiles has a new feature that lets you share information about yourself with your contacts. "This information is not public.You control who sees it. Once you've entered your contact information here, you can share it with your friends and family, so they always have the most up-to-date information." You can add your email addresses, phone numbers, and home address, and allow all your contacts or specific contact groups, like Friends or Family, to see this information on your profile. For some reason, Google doesn't prefill some of the fields like the email address or your Google Talk ID and you can't share the data with contacts that are not part of a group.